Meadow Woods Preserve is a 19.18-acre preserve located on Meadow Road in Lower Pawcatuck. It was donated to the Stonington Land Trust by the Richard C. Panciera Charitable Remainder Trust II, on November 29, 2012. The preserve abuts 9.62-acres of land owned by the Town of Stonington. Trails wind through both properties and are open to the public daily, dawn to dusk. Meadow Woods is primarily wooded with stone walls to the south and west. There are two-acres of farmland, which are farmed by Eugene and Nancy Bessette, of Shady Lane Farm. Preferring to use natural means of pest control the Bessettes use as little pesticide as possible on their crops, so offer the community responsibly- grown produce. Their farm stand is located at 240 River Road in Pawcautck, and is open daily 10am – 6pm, during the growing season. Access is at the end of Meadow Road. At the Meadow Woods Preserve sign go left, and circle around the edge of the farmland, until you meet the trail. After considering several projects, Eagle Scout Candidate, Alton Jones, of Boy Scout Troop 9, in Pawcatuck, committed to a work assignment on Meadow Woods Preserve for his Eagle Scout Service Project. With project goals in-hand, he got right to work, detailing his approach to the project, as well as gathering and scheduling several work parties of volunteers, both Boy Scouts and others interested in participating; young women included! They got busy with the tasks at hand; clearing and marking the existing trails. What a fine job they did. Not only did they do a great job clearing, they created log-edging for the trails, which not only defines the trail, but adds visual interest, as well. Also, they built a wash-board style crossing over a wetland area, which was definitely a functional and creative way to utilize log-debris on the preserve. Alton, also, as part of his project, diligently created a full-color, detailed, digital map of the preserve. He worked tenaciously at this, until he had it just right! Throughout the project, he displayed the organizational and communication skills of a true leader. We’re grateful for his courteous and enthusiastic attitude, as well as his excellent work ethic, all of which he exhibited from start to finish. The Stonington Land Trust appreciates the enormous amount of work that was accomplished by Alton Jones, the Boy Scouts and the many other willing volunteers who worked creatively and enthusiastically with Alton to help bring his Eagle Project to a successful conclusion…benefiting the Land Trust and our community. Thank you, Alton; thank you, all! You are a credit to our small Town! Subsequently, on March 23rd, Alton Jones attained the rank of Eagle Scout. Eagle Scout is the highest achievement one can attain in the Boy Scouts of America program. Notably, only about 5% of all scouts attain this rank. On Saturday, June 3rd, 2017, National Trails Day, the Stonington Land Trust hosted an easy slow-paced hike through the 19.18-acres of Meadow Woods, guided by Wildlife Specialist, Lisa Wahle. This preserve is mostly wooded, so exploring was comfortable, even though the afternoon weather was sunny and quite warm. 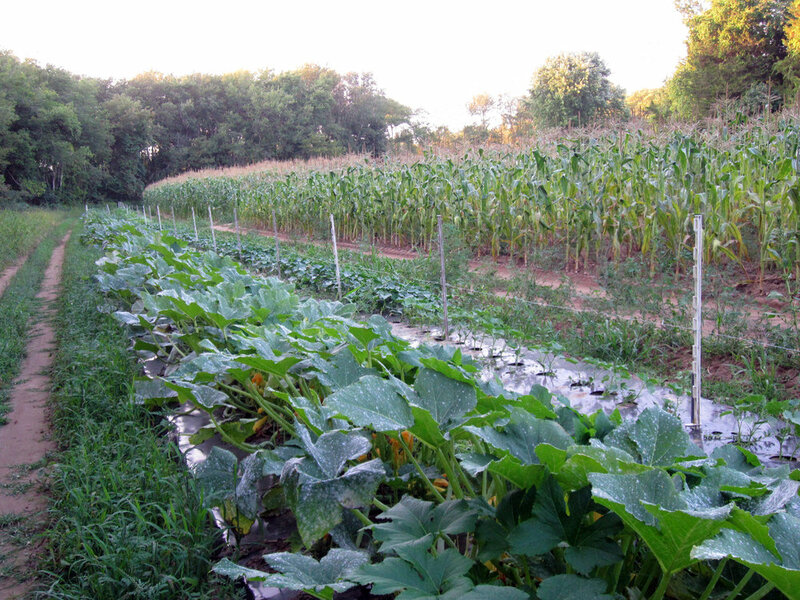 Included in this small, but unique, preserve are two-acres of active farmland, which are farmed by Eugene and Nancy Bessette of Shady Lane Farm. As we walked through the newly planted farm field, we had the pleasure of being guided by Eugene, a dedicated and enthusiastic farmer, who gave a brief presentation about their farming activity on this preserve. Among other things, he explained how they have implemented a unique irrigation system which conserves water. He also informed our guests that he uses as little pesticide as possible and the most natural ones that he can. Many were glad to hear that. Then, we wandered off to view the cage-free chickens, which our guests found quite interesting. Next, our guests had the distinct privilege of meeting Boy Scout, Alton Jones, who completed his Eagle Scout Service Project on this preserve. Dressed in his new Eagle Scout uniform, Alton explained his Eagle Scout Project. He gave details about how he and his Boy Scout Troop and many other willing volunteers worked with him to restore the Meadow Woods trail system, to create a washboard footbridge and to demarcate the trails. All in all, the afternoon was a huge success. In total, we had about 35-guests and we took three separate guided trips through the preserve and the farm. We are thankful to Lisa for her extensive wildlife knowledge and for sharing it with us that day. Also, we appreciated Eugene’s excitement about sharing the details of their farming activity. And of course, we were grateful to have Alton on site so he could share, with you, first hand the details of his Eagle Scout Project. He and all the young volunteers who worked on this project with Alton are a fine example of the young ones in Stonington, who are willing to be of service to their local community. We express our heartfelt thanks to all of you. Thank you, also, to our many guests. It was a pleasure sharing the afternoon with you. We look forward to seeing you again.